Samsung's Active line of phones have been dull but reliable machines for the last few flagship generations, and it looks like they're bringing them back for another round. GSMArena has posted photos of what definitely looks like a Galaxy S6 Active, and we've been able to confirm that this is what the phone will look like (with a very small margin of error) thanks to a secondary source. If you prefer your Samsung phones a bit more rough-and-tumble, this is the 2015 model for you. The leak implies that the GS6 Active will have the usual water and dust resistance, which is handy, since the mainstream S6 and S6 Edge lose that feature from last year's S5 model. Externally the phone gets a beefy case with the typical Active series physical navigation buttons and rear-mounted speaker. The heart rate monitor looks like it's at its usual spot next to the camera, but a plastic home button means no fingerprint reader. GSMArena claims that the Galaxy S6 Active will have a 3500mAh battery, much larger than the standard model, though that big a jump probably means it's also non-removable. Leaked but unconfirmed specs are otherwise identical to the S6: Exynos processor, 5.1" 2560x1440 Super AMOLED screen, and 16MP and 5MP rear and front-facing cameras, respectively. AT&T has jumped on both of the previous Active models, so it's no surprise that they're taking this one. Whether it will come to other carriers, and which international markets Samsung will sell to, are still up in the air. As far as the price of the Galaxy S6 Active, expect something quite similar to the regular GS6 and well below the S6 Edge. 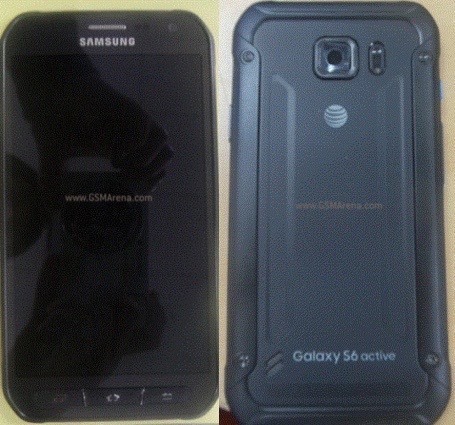 Constant leaker Evan Blass, also known as @evleaks, has posted two photos that look like press shots for the upcoming Galaxy S6 active. Aside from the slightly ridiculous light and dark camo coloring, they match up with the images above perfectly.